The estimated annual cost of energy that is wasted due to the various forms of light pollution world wide is $5,000,000,000 (Five Billion Dollars)! That amounts to $158.55 per second, 24 hours a day, seven days a week for an entire year. The counter above was started on January 1st, 2012 and shows the continuously increasing amount of dollars in wasted energy from the beginning of that year to the present. At midnight on New Year's Eve of this year (two years from when the counter was started), it will read $10,000,000,000.00! The Big Sky Astronomy Club is dedicated to the prudent and wise use of nighttime lighting and supports the efforts of the International Dark-Sky Association (IDA). 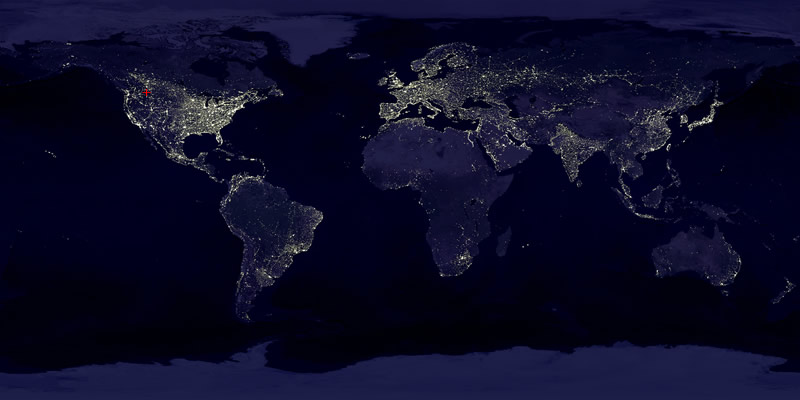 The above image of the Earth at Night was produced from data obtained from the Defense Meteorological Satellite Program. It was constructed from a mosaic of hundreds of individual images. While it is indeed a spectacular and beautiful picture, undelying its surface beauty are some ugly truths: the countless millions upon millions of inefficient and wasteful lights that it displays are damaging our environment, disrupting human sleep patterns and encroaching on the limited habitat of our wildlife, not to mention wasting billions of dollars in energy costs. The International Dark-Sky Association has estimated that at least one-third of all lighting in the U.S. is wasted; shining uselessly up into the night sky, illuminating areas that do not require lighting and over illuminating those areas where it is necessary. If you look closely at the image, you'll notice a little red cross-hair in the northwestern United States. That marks the location of the Big Sky Astronomy Club's home - Montana's Flathead Valley. Click on the cross-hair to go to our next Dark Skies page or, if you prefer, click the button below.